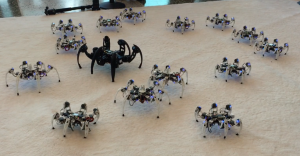 Intel Edison powered hexapod robots designed by the Intel research team. A blast from the past. In 2015 Robolit participated in the Intel Developer Forum as a design consultant as part of the keynote speaker technology demonstration. We were tasked with making a 50 member hexapod robot swarm to dance to the Up Town Funk. In the course of our work we produced the World’s first Mexican wave by robots. A lighting effect added into the Marauder, a hexapod with unique sliding mode locomotion mechanism, transformed the machine into a Starwars character. A list of video clips from this work can be found at the Robolit YouTube channel.